Great for a fancy pre-night out snack to line the stomach (if you are so inclined to host), to quell the munchies or as a general hearty snack. Piss easy to make, and taste bloody great – straight from oven to mouth. Ingredients, instructions and photo-instructions below. 10 mins prep, 15-20 mins chill, 25 mins cook. Makes 12 – 16. Grated Cheddar (medium block – about 100g) – the maturer the better. You can also chuck in any other leftover cheese you have for extra flavour. English Mustard (3 heaped tspn)– no more, mind. Smoked streaky bacon (half a packet). OR, a packet of fresh anchovies if you’re feeling for something fishy. Line a baking tray or two with greaseproof paper. Sprinkle flour on a surface, grab your rolling pin, and roll out the puff pastry into a rectangle, with the shortest side facing you.Try get it down to 0.5cm thickness. The shorter the rectangle, the longer the Cheese Twists. Rolling gently helps prevent the pastry from breaking. On the pastry, spread the mustard evenly covering everywhere. Then sprinkle on the black pepper, and cheese. Grab the bacon from the packet, and gently pull apart if they’re thick pieces, to have thin strips. Line the bacon along pastry, leaving gaps between each piece, for where you’ll cut the pastry. If you run out of bacon, find something else in the fridge… ham? Chorizo? Cut the pastry between each bit of bacon, and gently roll each piece at least 5 times, taking care not to stretch it out whilst doing so. Repeat, until you’ve run out of pastry. Stick them all on a baking tray and chuck them in the fridge for 20 mins, and then pre-heat the oven (200C/400F/Gas 6). Just can grate some parmesan over the top at this point, if you have some. Once removed from fridge, beat the one egg in a small pot or a mug and brush over them all. An oeuf is an oeuf! Bake for 20 – 30 mins, depending on how crispy you like ’em. I usually crack up the heat for the last 5-10 mins to crisp them up. Leave long, and put them in a mug or something for a grand display. Or, cut into two or three manageable bites. Steps 1-3. Roll, spread. sprinkle. Step 4-5. Line ‘n’ twist. Look at those! 20 mins in the fridge will do. Take them out when they look a bit like this. Eat them fresh out the oven for the full Cheese Twist experience. 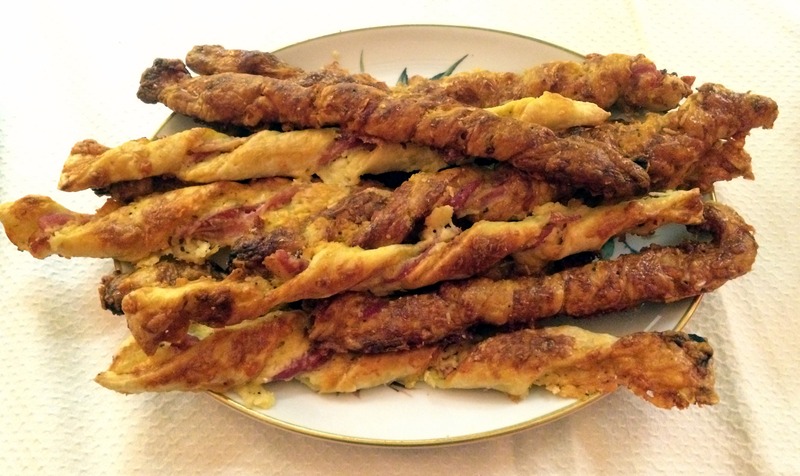 Alternatively, you can chuck in anchovies instead of bacon, and get something that looks a bit like this.